When I was 20 I (luckily) spent a few months in Paris, thanks to my uncle who was living there at the time. My cousin and I would spend our days exploring different parts of the city (old fashioned style with a paper guidebook). 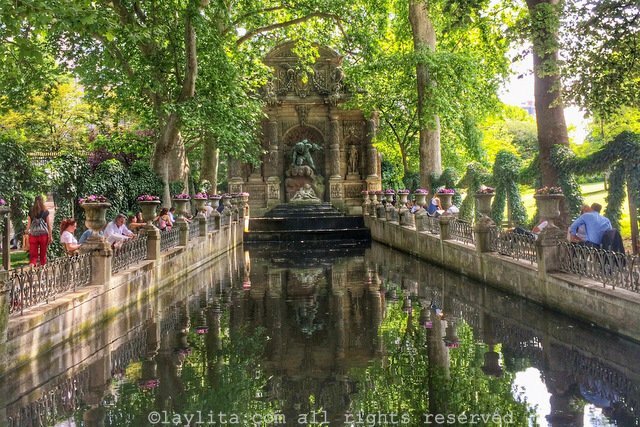 I remember going to the Jardin du Luxembourg (aka Luxembourg Garden) and trying to find the Medici Fountain. It was late fall and very cold, hardly anyone was in the park, and right as we reached the Lovers statue we saw a cute couple hugging. I think my cousin managed to snap a photo that included them as part of the scene. Fast forward to our last summer visit to Paris and I took my boys to the garden. They spent most of their time playing with these little boats you can rent. I was waiting for them and then I suddenly remembered that old visit to the Medici fountain. Once their boat time was up I made them (despite their whiny complaints about hating touristy stuff) come with me to find the fountain. I was shocked to see so many people there (the photo doesn’t show the whole setting – intentionally) and also quite a bit of trash in the fountain. But overall it was a great feeling of nostalgia and remembering those fun carefree days of being young and finding beautiful hidden corners in Paris.